So most of the time I feel like a do some variation of whining, judging or kvetching about one thing or another on this thing. This week I will give you (and myself) a break from all the gloom-doom, gripe-fest and give a quick jot of things that actually made me (gasp) happy this past week. Life is long/short. May as well smell the roses sometimes! Finishing a Book – I read a lot but lately I’ve been skipping around, reading multiple things at once and it is driving me nuts. I sometimes attempt to be the type or reader who can juggle multiple titles at once but I can’t. I’m a one book pony and I guess I should just finally embrace it. I finished Michael Pollen’s new book on psychedelics, How to Change Your Mind for my reading group (it’s always best to have peer pressure to make you finish something) and I liked the book well enough but I felt so satisfied when I completed it without much effort and time, proving to myself that yes, I’m literate and yes, I can read voraciously when I focus. Kids Playing At The Beach – I guess in connection with the book above, this past weekend I was watching this little boy, about 2-3 years old playing at the beach at the water line and it made me think about some of the ideas in the above book (saying young children are basically high in terms of their neural path developments) and how true it is. He was so adorable in the classic little kid way but he had this precociousness and awe of everything, the sand in his fingers, his feet touching water, it was like watching a little guru, alien life totally absorbed yet exhilarated. All kids are like this but trust me, this was like some strange universe he was inhabiting and it was so heart filling to observe it even if it was only from outside in. Henry Slesar's "The Self-Improvement of Salvadore Ross" – I listened to this by chance while getting ready to leave the house the other day on WNYC’s Selected Shorts Program. It was apparently a Twilight Zone Episode too. It’s about a guy who can barter something he has for something that he wants. He is doing all this for the affections of his long standing crush, it doesn’t work out of course but the turns of self improvement, the efforts and the strategies to get there are twisted, familiar and in plain language revealed. 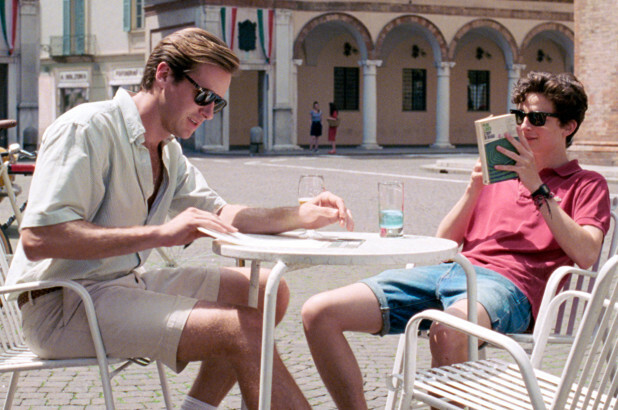 Call Me By Your Name – This movie! I can’t believe I only just saw this movie! It’s so lush in cinematic eye (almost too lush) but the tones, the long edits, and the acting, especially by Timothée Chalamet, is heart rending. For total romantics this movie crushed you in that bitter sweet way that only the want and depth of love can make you feel. Gallery – I never talk about this but I love running my gallery. I feel so lucky and grateful for all the people I have gotten to know through it. Instant Noodles – I watched a quick TV episode on Ramen and then I was like ‘I must have ramen,’ for 48 hours after. I didn’t manage to get the real thing but it’s pretty amazing how easy it is to get instant noodles, a few vegetables, one egg and voila, you are a baby chef for under $3. Amazing. Beach – NYC can be a real god-damn-slog but the fact that you can get to the ocean via train is pretty miraculous. Summer...Don’t go! Fingers and Toes – Yo, seriously, if you have 10 of each you are pretty freaking lucky. In seriousness though, we, who have so much, often forget all we have and that is something I have been trying to re-align myself with. It’s amazing what we have. Morning Glories – Seeing those delicate vines climb on fences, gates, gutters, wherever they can and those brilliant, impossibly thin and easily bruised trumpet like flowers just peeping out at you is like seeing constellations in cement. Cats – Cliché, cliché, I know but having a furry friend(s) is the best type of company sometimes. That thing they do when they can sense when you are sad or crying or feeling blue and they come up to you and nudge you and curl up comfort you by just having their tiny beating heart near yours. It’s a type of companionship that is literally beyond words. Art Season – I was going to see so much art the past few weekends but life circumstances happened and that’s okay but yeah, I’m very excited to see the shows up and about to be up. It’s funny, you think it would get boring but somehow every fall there is this tingle of newness and possibility. I am thirsty for it and can’t wait to see it all and think about it all and probably complain about it all on this thing.